Dubai, UAE - April 6, 2019: Fresh from qualifying for the Gov Games 2019 men’s final with Team F3, His Highness Sheikh Hamdan bin Mohammed bin Rashid Al Maktoum, Crown Prince of Dubai and Chairman of the Executive Council of Dubai, returned to an energised Gov Games site on Dubai Kite Beach today to inspire 36 teams competing in men’s Heat 3. 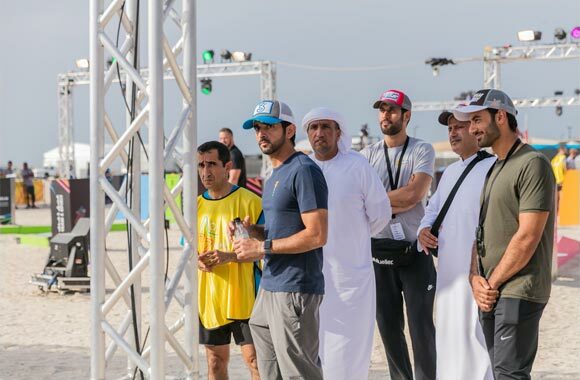 With the last two qualifying spots in the Gov Games final at stake in men’s Heat 3, Sheikh Hamdan wished luck to competitors, interacted with spectators and received a briefing from Marwan Bin Issa, the Director of Gov Games, which is organised by the Executive Council of Dubai in partnership with Dubai Sports Council. Sheikh Hamdan’s gesture is a timely reminder of the competition’s ethos of teamwork and theme of One Team, One Spirit. In the men’s Heat 3, Abu Dhabi Police produced a dominant performance across nine obstacles to score 125.75 points. The team narrowly edged out their colleagues at Dubai Police, who finished second and also qualify for the finals. The men’s Heat 3 results ensures an all-UAE line-up for a dramatic Gov Games finale on Saturday, April 6. The women’s final will feature F3, the UAE Ministry of Education, Dubai Tourism, Dubai Municipality, Dubai Airports and DEWA, while Abu Dhabi Police and Dubai Police join F3, Fujairah Police, Dubai State Security Apparatus and the UAE Ministry of Education in the men’s final. Both finals will take place on The Battleship – a giant obstacle reserved exclusively for the competition finale. The AED 3 million Gov Games prize pool is split with men’s and women’s winners receiving AED 1 million each. Second and third-placed men’s and women’s teams will receive AED 300,000 and AED 200,000, respectively. After the completion of all the men’s and women’s Heats, the only obstacle to have defeated all 168 teams has been named as The Weakest Link – a test of strength, balance, arithmetic, coordination, communication and strategic-thinking.